Hilltop Cottage captures the soul of Michigan Lakeshore cottage living. 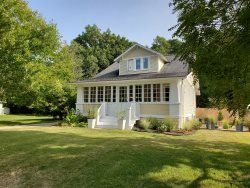 Secluded in the trees of Michiana, this cottage offers quiet privacy only walking distance from the beach. Catch up on your summer reading in the screen porch, nap in the hammock on the ridge overlooking the lake, or relax with friends in the hot tub. Wherever you end up at this property, you can be sure you'll be taking full advantage of what Michigan has to offer. Enter the main floor through the screened in porch. A dining table provides a nice area for al fresco dining. From there, the porch opens into a small tv room and adorable breakfast nook. The galley kitchen provides a path to the dining room with seating for six. A large brick fireplace provides welcome ambiance to the living room. Through the living room the master bedroom with an en suite full bathroom gives uninhibited views of the forest surrounding the house. The upstairs loft hosts the second bedroom. In it are two twin beds and a queen bed. Outside, the hot tub a few yards from the house is a fantastic place to relax, soak, and enjoy nature. It's not uncommon to see deer traipsing through the property. A short walk up the hill behind the house is a small sitting area and hammock overlooking Lake Michigan.